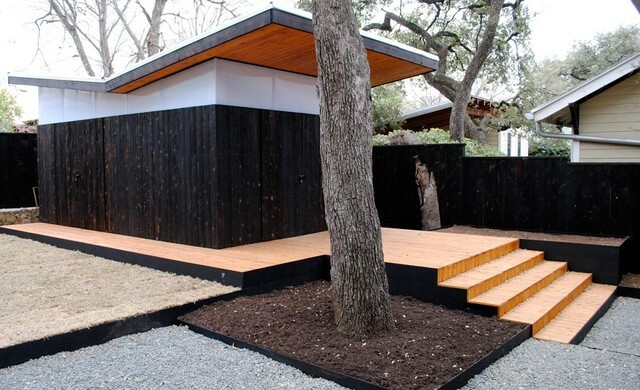 Charred timber and the rise of Shou Sugi Ban as a cladding and fencing material seems to be getting very popular and has sprung up everywhere from gardens at the Chelsea flower show to uber-trendy building cladding. So what is Shou Sugi Ban Yakisugi? It translates as “burnt cedar board”. This process was invented as a way to make wood less susceptible to fire and to keep away insects and rot. On the face of it, this traditional Japanese technique involves simply burning your building materials. It goes without saying it’s not quite as simple as this, it takes practice patience and a great deal of experimenting to get a dark even finish. The idea is to burn the surface of the wood to a varying degree of charring. Then the burnt surface can be left completely untouched, or it can be heavily or lightly scrubbed, you can then seal with a clear coat or a stain. The charred surface is then naturally resistant to rot, pest, weather, UV, and fire; in addition to being aesthetically striking, and hauntingly beautiful. Charred cladding is having a real resurge in popularity at the moment. It is turning up in all kinds of location from funky city lofts in New York to newsstands on the banks of The Thames. If you read the architectural press you would be forgiven for thinking this is a new reinvention of a mysterious eastern alchemy, not so! The artists David Nash has become known around the world for his chainsaw carved burnt sculpture. We have also been producing charred timber street furniture for over 15 years for a huge variety of schemes all around the country. So if you would like too know more about this unique finish and use it in one of your projects ,why not talk too us? with 20 years experience in this field you can rest assured that we know what we are doing.